Analysis on a previous skeleton found near Stonehenge showed that that person was also a migrant to the area. The “Boy with the Amber Necklace”, as he is known to archaeologists, was found in 2005, about 5km south-east of Stonehenge on Boscombe Down. 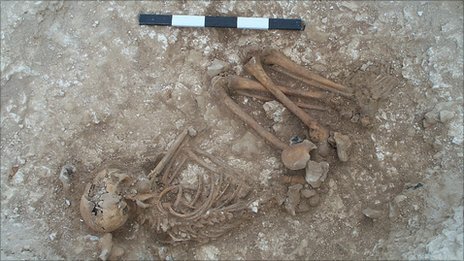 The remains of the teenager were discovered next to a Bronze Age burial mound, during roadworks for military housing. “He’s around 14 or 15 years old and he’s buried with this beautiful necklace,” said Professor Jane Evans, head of archaeological science for the BGS. 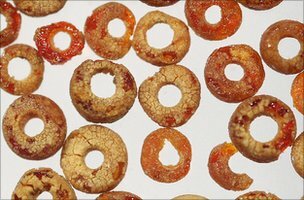 Dr Andrew Fitzpatrick, of Wessex Archaeology, backed this interpretation: “Amber necklaces are not common finds,” he told BBC News. Professor Evans likened Stonehenge in the Bronze Age to Westminster Abbey today – a place where the “great and the good” were buried. Tooth enamel forms in a child’s first few years, so it stores a chemical record of the environment in which the individual grew up. Two chemical elements found in enamel – oxygen and strontium – exist in different forms, or isotopes. The ratios of these isotopes found in enamel are particularly informative to archaeologists. Most oxygen in teeth and bone comes from drinking water – which is itself derived from rain or snow. The isotope ratio of strontium in a person’s teeth can provide information on the geological setting where that individual lived in childhood. By combining the techniques, archaeologists can gather data pointing to regions where a person may have been raised. Tests carried out several years ago on another burial known as the “Amesbury Archer” show that he was raised in a colder climate than that found in Britain. Analysis of the strontium and oxygen isotopes in his teeth showed that his most likely childhood origin was in the Alpine foothills of Germany. “Isotope analysis of tooth enamel from both these people shows that the two individuals provide a contrast in origin, which highlights the diversity of people who came to Stonehenge from across Europe,” said Professor Evans. The Amesbury Archer was discovered around 5km from Stonehenge. His is a rich Copper Age or early Bronze Age burial, and contains some of the earliest gold and copper objects found in Britain. He lived about 4,300 years ago, some 800 years earlier than the Boscombe Down boy. The archer arrived at a time when metallurgy was becoming established in Britain; he was a metal worker, which meant he possessed rare skills. “We see the beginning of the Bronze Age as a period of great mobility across Europe. People, ideas, objects are all moving very fast for a century or two,” said Dr Fitzpatrick. Other people who visited Stonehenge from afar were the Boscombe Bowmen, individuals from a collective Bronze Age grave. Isotope analysis suggests these people could have come from Wales or Brittany, if not further afield. Solving Stonehenge – The experts gather………. // ]]>For media enquiries speak to Administration and Marketing Officer Sara Willis. A new long-distance footpath from Avebury Stone Circle to Stonehenge could topple Hadrian’s Wall as the UK’s most popular walking attraction. The pathway is being planned by the Friends of the Ridgeway, who want to widen their focus beyond the National Trail. Ian Ritchie, chairman of the Friends, told members of the Marlborough Area Board last week that the walk could pump an estimated £6 million into the local economy. 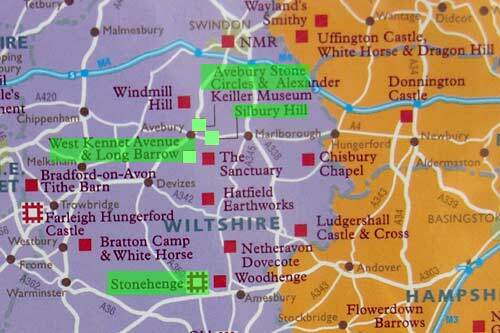 Mr Ritchie, who lives at Ramsbury, explained that the 29 mile Great Stones Walk connecting the two World Heritage Sites would pass through some of the best archaeological and historic sites in Britain. He said: “This route has real historical integrity and goes by and through a wealth of archaeological and historic sites. As well as being an international attraction for walkers, it would bring a welcome boost to the ailing rural economy. The Friends estimate the walk would attract between 200,000 to 400,000 extra visitors a year and say consultations are taking place with landowners and parish councils along the route. Later Mr Ritchie told the Gazette that the new path would link existing footpaths, bridleways and rights of way. The cost of improving the route to National Trail standards has been estimated at about £105,000 and Mr Ritchie said it was hoped that much of the funding would come from the Salisbury Plain and North Wessex Downs AONB groups. The area board meeting gave the new walk proposal its unanimous backing. 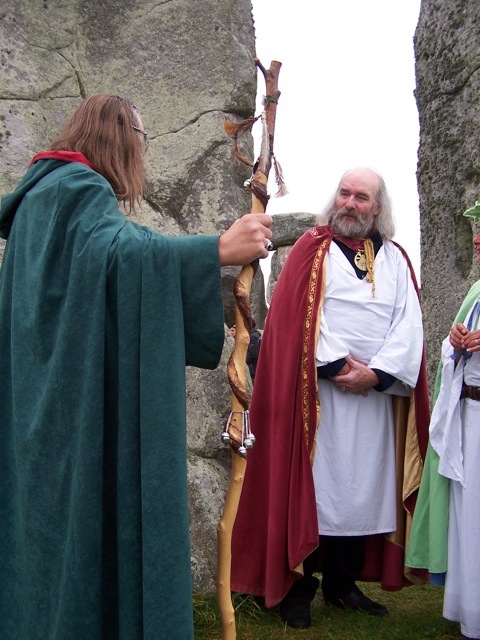 Last year saw a large number of people (including Druids) turn up at Stonehenge on the wrong day in 2009? I thought I would clarify the correct ‘Winter Solstice’ day for 2010 to save any embaresment. The summer solstice is always on the 21st, however the winter solstice can fall on the 21st or the 22nd. The celebration does not always fall on the same date as the solstice because the modern year does not correspond precisely to the solar one. The exact time for the Winter Solstice is December 21st, 11.39pm (UK time). The sunset on the 21st is at 3.53pm and the sunrise on the 22nd of December at 8.04am. Exceptionally, you can also expect a full moon on December 21th. Stonehenge is carefully aligned on a sight-line that points to the winter solstice sunset (opposed to New Grange, which points to the winter solstice sunrise, and the Goseck circle, which is aligned to both the sunset and sunrise). 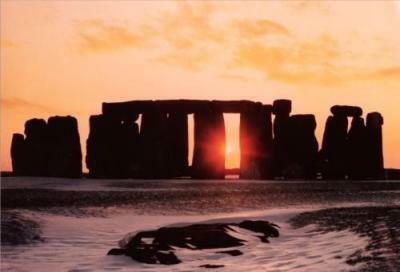 It is thought that the Winter Solstice was actually more important to the people who constructed Stonehenge than the Summer Solstice. The Winter Solstice was a time when most cattle were slaughtered (so they would not have to be fed during the winter) and the majority of wine and beer was finally fermented. Stonehenge features an opening in the henge earthwork facing northeast, and suggestions that particular significance was placed by its builders on the solstice and equinox points have followed. For example, the summer solstice sun rose close to the Heel Stone, and the sun’s first rays shone into the centre of the monument between the horseshoe arrangement. While it is possible that such an alignment can be coincidental, this astronomical orientation had been acknowledged since William Stukeley drew the site and first identified its axis along the midsummer sunrise in 1720. Stukeley noticed that the Heel Stone was not precisely aligned on the sunrise. Year to year, the movement of the sun across the sky appears regular. However, due to temporal changes in obliquity of the ecliptic, illumination declinations change with time. The purported Heel Stone alignment with summer solstice sunrise would have been less accurate four to five thousand years ago. The Heel Stone, in fact, is located at 1/7th of circumference from due North, as noted by archaeologist James Q. Jacobs. Stukeley and the renowned astronomer Edmund Halley were to attempt what amounted to the first scientific attempt to date a prehistoric monument. Stukeley concluded the Stonehenge had been set up “by the use of a magnetic compass to lay out the works, the needle varying so much, at that time, from true north.” He attempted to calculate the change in magnetic variation between the observed and theoretical (ideal) Stonehenge sunrise, which he imagined would relate to the date of construction. Their calculations returned three dates, the earliest of which, 460 BC, was accepted by Stukeley. That was incorrect, but this early exercise in dating is a landmark in field archaeology . . 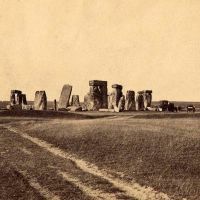 Early efforts to date Stonehenge exploited tiny changes in astronomical alignments and led to efforts such as H Broome’s 1864 theory that the monument was built in 977 BC, when the star Sirius would have risen over Stonehenge’s Avenue. Sir Norman Lockyer proposed a date of 1680 BC based entirely on an incorrect sunrise azimuth for the Avenue, aligning it on a nearby Ordnance Survey trig point, a modern feature. Petrie preferred a later date of AD 730. The necessary stones were leaning considerably during his survey, and it was not considered accurate. An archaeoastronomy debate was triggered by the 1963 publication of Stonehenge Decoded, by British-born astronomer Gerald Hawkins. Hawkins claimed to observe numerous alignments, both lunar and solar. He argued that Stonehenge could have been used to predict eclipses. Hawkins’ book received wide publicity, in part because he used a computer in his calculations, then a rarity. Archaeologists were suspicious in the face of further contributions to the debate coming from British astronomer C. A. ‘Peter’ Newham and Sir Fred Hoyle, the famous Cambridge cosmologist, as well as by Alexander Thom, a retired professor of engineering, who had been studying stone circles for more than 20 years. Their theories have faced criticism in recent decades from Richard J. C. Atkinson and others who have suggested impracticalities in the ‘Stone Age calculator’ interpretive approach. Indeed the stones are great, and certainly have had the power to capture the imagination of poets and artists through the centuries. On the 21 September 2005, the heritage journal started the anthology of Megalithic Poems, a colleague warned that we’d be hard pressed to find even half a dozen on the theme of the megalithic structures and prehistoric sites of Britain, Ireland and the European continent. Five years on and there are now some 300 poems on the blog, and an equal number of drawings, paintings, prints or photographs to accompany them. The poems stretch over a period of some eight hundred years; from Laymon’s poem, Brut (above), of 1215 describing Stonehenge, to poems written only a few months ago. What does this tell us? Well, perhaps that not only have these structures inspired poets like Blake and Wordsworth (as well as artists such as Constable and Turner) down through the ages but also that this marvellous, mysterious megalithic heritage of ours continues to inspire us even today. At a time when so much of our heritage is at risk through development and mismanagement (Tara in Ireland for example, even Stonehenge and Avebury) perhaps these poems, and the images that accompany them, will continue to inspire those who would take time out from busy lives to visit and ponder upon this often overlooked aspect of our heritage. Not only that, hopefully this anthology will also act as a warning that these places, built by our forefathers millennia ago, are in constant need of our care and attention lest, after thousands of years having, “…brav’d the continual assaults of weather…” (William Stukeley) they are finally lost for all time through the greed, ignorance and insensitivity of the 21st century. Since September 2005 we’ve added many more poems and images on the megalithic theme in the hope that they’ll become a useful resource for those interested in the poetry, art and the history of our megalithic past – none of which would appear on the blog without the remarkable efforts and creativity of those who have written about megaliths or portrayed them in their work – not forgetting of course those who originally conceived and built these amazing structures! To everyone, a very big thank you. We hope you will find as much pleasure browsing through the anthology as we have taken in compiling it.